I saw the Johnsons present their travel movies when I was very young. My grandparents took me, and the book was on their shelf....now on mine. I love this book and have read it many times. The story of their romance is charming, and her courage at a young age is amazing. You may often see it in decorator/design magazines, because of the beautiful zebra print cloth cover. Philadelphia: J. B. Lippincott Company, 1940. First Edition. Near Fine. First edition, signed limited issue. Copy #41 of a limited 520 copies, signed by Osa Johnson and inscribed with "Best African Wishes." Bound in publisher's marble-affect cloth over red cloth spine, decorated in gilt, top edge gilt. Near Fine. Spine shows white soiling, light wear at ends, rubbing and dulling to gilt lettering. Pages toned. A charming love story and biography, in which Osa Johnson details her life and travels in Africa and the South Seas, alongside her husband, Martin Johnson. J.B. Lippincott Company, Philadelphia, 1940. 1st edition, 1st printing.. Hardcover. Fair. 8vo, hardcover, zebra-striped cloth boards with "Adventure" appearing in italics on the front board, endpapers showing photo of giraffes. Presentation copy, SIGNED by author Osa Johnson on half-title pg. Good condition in fair dj. Small prev. owner's name-label on front paste-down; one page corner creased; very occasional, sparse interior foxing, contents otherwise clean, unmarked, binding firm; rear hinge paper shows rubbing but rear board quite firmly attached. Blue dust jacket depicts a drawing by one Cravath of the African continent with a parade of wildlife (crocodile, giraffe, hippo, rhinos, elephants) streaming down the continent followed by the Johnsons further north with their camera equipment. Jacket moderately rubbed & edge-worn w/ two 2-inch chips at rear edge of spine, though no loss of spine lettering; jacket now housed in protective mylar wrapper. 376 p., 83 aquatone illustrations, portraits. I Married Adventure: The Life and Adventures of Martin and Osa Johnson. Philadelphia: J.B. Lippincott Company, 1940. First edition of Johnson's classic work. Octavo, original striped cloth, photographic endpapers illustrated with 83 aquatone illustrations. Boldly signed by Osa Johnson on the half-title page. In good condition, lacking the rare dust jacket. In the first half of the 20th century an American couple, Martin and Osa Johnsonfrom Lincoln, Kansas and Chanute, Kansas, respectivelycaptured the public's imagination through their films and books of adventure in exotic, faraway lands. Photographers, explorers, marketers, naturalists and authors, Martin and Osa studied the wildlife and peoples of East and Central Africa, the South Pacific Islands and British North Borneo. They explored then-unknown lands and brought back film footage and photographs, offering many Americans their first understanding of these distant lands. "Books of adventure are so numerous....[But] this one is unique. It has the human quality of a novel and the permanence of social history" (Katherine Woods, The New York Times). 1989-04-08. New. Ships with Tracking Number! INTERNATIONAL WORLDWIDE Shipping available. Buy with confidence, excellent customer service! Philadelphia: J. B. Lippincott, 1940. First edition, the first issue with "Adventure" in italic on the upper cover and no other printings stated on the copyright page. Illustrated with 81 black and white photographs of the author's adventures. 8vo, in the publisher's original tan and dark brown zebra-striped cloth lettered on the upper cover and spine in dark brown, with photographically decorated endpapers of grazing giraffes. 376, index pp. Internally a clean, solid and fresh copy with little evidence of use, the cloth a bit mellowed, primarily at the spine panel. UNCOMMON FIRST EDITION of this wonderful and romantic account of the travels of Martin and Osa Johnson. From early humble beginnings in Kansas to adventures that included rafting in Borneo, tenting on safari, hunting in the Congo, dashes in Paris and New York, dealings with cannibals and head-hunters, bad humoured rhinos, lions, apes, Charlie Chapman, Jack London, George Eastman and the King and Queen of England to name only a few. Many of the photographs are exceptional in quality. The Johnsons are hard to define, they can be considered photographers, naturalist, explorers, marketers, conservationists, authors, feature filmmakers, scientists or anthropologists; and they excelled at all of these. The Johnsons piloted their own boats, flew their own aircraft, and recorded the first movie with sound in Africa. Osa was the second women to be featured on a 'Wheaties' cereal box. J.B. Lippincott. Hardcover. B00005W4QX Like New Condition. . Fine. J.B. Lippincott. Hardcover. B00005W4QX New Condition. . New. Philadelphia: J. B. Lippincott Company, 1940. First edition. Tall octavo (24 cm); zebra patterned cloth with 'Adventure' italicized; brown top-stain; photographic endpapers; 376 pp. ; 83 illustrations from photographs, dust jacket. A desirable first edition ~ first printing with 'Manufactured in the United States of America by the Haddon Craftsmen, Inc., Camden, N. J.' to copyright page. An about Near Fine copy excepting a faint ribbon of dampstaining evident to rear endpaper and pastedown; binding tight and the text clean and unmarked. In the scarce first printing dust jacket, which is unclipped ($3.50). General rubbing and wear with chipping to spine ends and flap folds with a couple of crude tape repairs to top of the rear panel; dampstaining evident to jacket verso. Good only, but serviceable and incredibly difficult to find a first printing copy with its original and unrestored dust jacket. New York, NY: J. B. Lippincott, 1940. First Edition. Hard Cover. Very Good +/Lacking dust wrapper. 8vo. 376 p. Bound in brown and cream zebra-patterned cloth, 'Adventure' in italics on front cover and spine, deckle edge, top-edge stained red. Lacking dust wrapper. Illustrated with black and white photographs. Very Good+, internally clean, minor abrasions to lower edges of binding and lower edge of rear endpapers, hinges strong and sound, small, light smudge above title on spine, rubbing and wear to extremities. Excellent copy. Philadelphia: J. B. Lippincott Company, 1940. Fifth Impression. Hardcover. Very Good/No Jacket. Illustrated. Signed by the author. Osa and Martin Johnson built a career as world travelers and film makers in remote areas of the world. Martin began life as a traveler when, in 1906 as a nineteen year old he responded to Jack London's advertisement and was chosen as a crew member for London's upcoming around-the-world sailing adventure aboard the "Snark. This copy is signed by the author, Osa Johnson on the back of the half title page. Black cloth (possibly rebound?) with gold spine lettering. Illustrated. A few pages with marginal scribbling. Ex-library. 376pp., index. Full refund if not satisfied. 1997-08-04. New. Ships with Tracking Number! INTERNATIONAL WORLDWIDE Shipping available. Buy with confidence, excellent customer service! Philadelphia: J. B. Lippincott Company, 1940. First Edition. Hardcover. Good. First edition. (No subsequent printings listed and "Adventure" in italics on the front cover.) 376 p. Zebra-striped tan cloth. Good+ condition. No jacket. Cloth lightly stained. Glue spots on front free endpaper from removed bookplate. Back hinge exposed, front starting. As The Atlantic Monthly stated: "As good an 'escape story' as you are apt to run into for some time. J.B. Lippincott Company, 1940. First Edition. Hard Cover. Very Good/No Jacket. First edition. Lacks jacket. Boards lightly foxed and toned (as usual). 1940 Hard Cover. 376 pp. 8 5/8 x 6. Zebra cloth, photographic endpapers. 83 illustrations, including photographs featuring George Eastman, founder of Eastman Kodak, American author Jack London, and film star Charlie Chaplin. A documentary travelogue of the adventures of Martin and Osa Johnson, primarily in Africa and the South Seas. not specified: J. B. Lippincott Company, 1940 Hardcover, zebra pattern cloth binding. Front and back endpapers photo of giraffes on Savannah. Owners name in ink FFEP. Textblock: Age yellowing. 376 pp including index. Many photographs. Clean. 1/2" closed tear bottom p 100. J.B. Lippincott, 1940. Couverture rigide. Bon/Pas de jaquette. Edition/printing not stated. Zebra striped buckram with bottom shelf wear but not rubbed through aywhere. Page edges soiled and/or age toned but interior is bright and fresh: only marking is POS on FFEP. Stated 85 aquatone illustrations. Though there are no splits or cracks and the book is still square, the binding nonetheless feels loose to the touch with a slight roll developing at the tail. Lippincott. Hardcover. B002HA2KUO Very Good Condition. Has some wear. Five star seller - Buy with confidence! . Very Good. Lippincott, 1941-01-01. First Edition. Hardcover. Good/Acceptable. J.B. Lippincott Co., 1940. Assumed First Edition: No additional dates, editions, or printings stated; Manufactured in the United States of America by the Haddon Craftsmen, Inc., Camden, N. J.' stated on copyright page. 376pp. Zebra-print cloth boards. Binding is sturdy and intact; text, photo illustrations very good throughout. Light shelfwear to edges of boards, corners gently bumped. Dust jacket is whole, but has several chips and closed tears at edges; light rubbing, age-toning to DJ as well. NOT an ex-library copy, NO remainder mark, NOT a book club. Ships from Dinkytown in Minneapolis, Minnesota. J.B. Lippincott Company, 1940. Hard Cover. Very Good/Good. Orange cloth spine over boards, not zebra-striped cover. Jacket edges rubbed with minor loss, ink stamp on title page. 1940 Hard Cover. 376 pp. 8 5/8 x 6. 83 illustrations, including photographs featuring George Eastman, founder of Eastman Kodak, American author Jack London, and film star Charlie Chaplin. A documentary travelogue of the adventures of Martin and Osa Johnson, primarily in Africa and the South Seas. U.S.A.: J.B. Lippincott Co., 1940. 376pgs. Brown Zebra patterned cloth. Attractive bookplate on the front pastedown. Giraffe photo endpapers. Osa Johnson's inscrption "With best African wishes, Osa Johnson", on the verso of the Half-title page. There is light wear to the spine, and toning to the pages, otherwise a vintage, unmarked copy An obituary from the Trentionian newspaper dated January 8, 1953 is laid in, as well as an article with a photo of her and her manager/husband dated Feb.3, 1941 (She remarried after her husband's death in a plane crash in 1937, which she survived).. Author Signature and Inscription. Fifth Impression. Hardcover. Very Good/No DJ. Octavo. Philadelphia/New York/London/Toronto: J. B. Lippincott & Co., 1940. First Edition First Printing . Hardcover. Good+. True account of the travel adventures of the author & her husband, Martin, renowned big game hunter & photographer, focusing on their years on the shores of Lake Paradise in Africa. A FIRST EDITION First Printing from 1940, this hardcover book has brown-&-white zebra-striped cloth over boards, decorative endpapers, in 376 pages with 85 aquatone photos throughout, Index. TCondition is downgraded to only Good+ due to rubbing, bumped corners, & general edgewear. Interior is clean, binding strong & straight, pages mildly tanned. A very few small random foxed spots. NO writing, underlining, or highlighting; NOT ex-lib. Missing DJ. Please see our photos! Description & photos copyright Gargoyle Books 2019. Same Day Shipping on all orders received by 2 pm weekdays (Pacific time); Weekends & holidays ship very next business day. Garden City, New York: Halcyon House, 1942-01-01. 1st Thus. Hardcover. Good+/Good+ Dust Jacket. Signed by Author. 376 pp. Dust jacket is price clipped. 1st Thus, published by Halcyon House in 1942 (true first published in 1940). Signed by the author without personalization on the verso of the half-title. Includes several black and white photographs throughout the text. A Good+ book with age toning to the pageblock and the pastedowns, and the textblock. Book also shows offsetting on the pastedowns. Dust jacket is Good+, price-clipped, shows significant edge wear and rubbing, and two small dampstains on the reverse of the dust jacket. DJ protected in Mylar wraps. Ships from Dinkytown in Minneapolis, Minnesota. William Morrow & Co, 1989-04-01. Hardcover. Used:Good. Halcyon House, 1942. Reissue. Hard Cover. Very Good/Fair. Reissue. Very good hardcover in fair jacket. Ink stamp and sticker removal mark on front endpaper, jacket edges heavily rubbed with several tears and chips, extensive repairs with clear tape (now toned) on jacket reverse. 1942 Hard Cover. 376 pp. 8vo. 9 1/4 x 6 3/8. Original zebra striped cloth. 83 aquatone illustrations, including photographs featuring George Eastman, founder of Eastman Kodak, American author Jack London, and film star Charlie Chaplin. A documentary travelogue of the adventures of Martin and Osa Johnson, primarily in Africa and the South Seas. William Morrow & Co. Hardcover. 068808687X New Condition. . New. William Morrow & Co. Hardcover. 068808687X Like New Condition. . Fine. Kodansha USA. PAPERBACK. 1568361289 New Condition. . New. New York: William Morrow & Company Inc., 1989. This is a FIRST EDITION of the revised edition of 1989. Quarter tan cloth with black lettering on spine offwhite boards. not price-clipped dust jacket is in good condition but has been tape reinforced at the head of the spine which repairs two quarter inch tears. 94 black and white photos in eight 8-page photo inserts with endpaper maps and index. This includes the review slip from the publisher. Martin Johnson (October 9, 1884  January 13, 1937) and his wife Osa Johnson (née Leighty, March 14, 1894  January 7, 1953) were adventurers from Kansas. In the first half of the 20th century an American couple from Chanute, Kansas named Martin and Osa Johnson captured the public's imagination through their films and books of adventure in exotic, far-away lands. Photographers, explorers, marketers, naturalists and authors, Martin and Osa studied the wildlife and peoples of East and Central Africa, the South Pacific Islands and British North Borneo. They explored then unknown lands and brought back knowledge of civilizations thousands of miles away through their films, writings and lectures. Martin Johnson took part as a crew member and cook in Jack London's 19071909 voyage across the Pacific aboard the Snark. After that, he started a traveling road show that toured the United States displaying photographs and artifacts collected on the voyage. He met Osa Johnson while passing through her hometown of Chanute, Kansas, and they married. After seven years, Martin and Osa raised enough money to depart for new adventures, going first to the Solomon Islands, and later Borneo, and still later Africa. Martin Johnson died in the crash of a Western Air Express commercial flight near Burbank, California in 1937; Osa was severely injured but recovered. by October, 1937, the New York Times was publishing dispatches of Osa's latest trip to Africa, in which she described lifestyles and practices of the Masai and other tribes. She died in New York City of a heart attack in 1953.. First Revised Edition. Quarter Cloth. Near Fine/Good. 8vo - over 7¾" - 9¾" tall. Hardcover. Garden City, New York: Halcyon House. Very Good with no Dust Jacket. 1942. First Edition. Hard Cover. 011299: No dustjacket is included. Is ex-library copy in dark brown boards, with library white marking at bottom of faded spine, and library stamp found on one interior page. Otherwise, boards and pages are clean, unmarked (except as indicated), bright, tightly bound and sharp cornered. Scarce, Out Of Print, Book. Has small light stain at top of first few pages. Contains over 60 pages of black and white photographic illustrations. "Here, in a story about everywhere else in the world, is romantic Americana that will one day be history. These pages are themselves adventure. Here the watchmaker's boy from Independence out in Kansas meets the Santa Fe engineer's daughter from Chanute, plain people from the prairies. Against that homespun background is woven a life and career filled with exotic color. ": Ex-Library: B&W Photographs: 6.25 x 9.25 in. : 376 pages . New York: J. B Lippincot Co, 1940. Color dust jacket chips, edgewear, half of spine missing. $3.50 83 illustrations from photographs. Nice copy of scarce early printing.. Adventure. First Edition Early Printing.. Cloth. Very Good/Good to Fair. Philadelphia: J. B. Lippincott Company Copyright is 1940. 376 pages indexed. Early book of the month club edition, with zebra stripped cloth covers. Covers are slightly rubbed, though generally very good. Slight foxing on covers and end leaves. Book plate on blank verso of pictorial front free end leaf. Jacket is chipped, and worn, mostly along edges. Publisher's name over foot of spine is affected, though other lettering and images on dust jacket remain good. Jacket is now protected in a clear mylar sleeve. . BOMC. Cloth - Hard Cover. Good+/Fair. Halcyon House. Hardcover. B0006APSMO 1942 Hardback copy, text is clean, binding is good, covers have some wear, has p.o. name inside, has no D/J. shelf-23 . Good. Philadelphia: J.B. Lippincott, 1940. Original zebra pattern cover. A tight, clean, unmarked copy.. First Edition. Brown and Sand Cover. Near Fine. Illus. by Photographic Plates. Quarto. Philadelphia: J. B. Lippincott. Good with no dust jacket; Boards worn, shaken, part of owner address label . and owner name on front endpapers, pages toned.. 1940. early printing. Hardcover. In that cool zebra patterned cloth binding. Osa relates her worldwide adventures with her photographer husband. Photos, index. ; Book Club Edition; 375 pages . Condition: Good with no dust jacket; Boards worn, shaken, part of owner address label and owner name on front endpapers, pages toned. Halcyon House. Hardcover. B0006APSMO 1942 Hardback copy, text is clean, covers have wear, front hinge is cracking needs some binding tape. shelf-23 . Good. Kodansha USA. PAPERBACK. 1568361289 Like New Condition. . Fine. Garden City, NY: Garden City Publishing Co., 1940. Book. Near Fine. Hardcover. First Thus. Brown and tan zebra-skin patterned cloth. 1st of this (reprint) edition. 376 pp., illus. w/ sepia-tone photographs. Slight rubbing to spine extremities, minor toning along text block edges. Former owner's signature on upper front flyleaf, otherwise unmarked. Purple and green illus./pictorial dust jacket is mildly rubbed along edges with a few small chips, mild rubbing along flap folds, price-clipped front flap, decently preserved and now in mylar..
Garden City, New York: Garden City Publishing, 1940. No dustjacket, covers have moderate wear, lower corner has taken a very hard bump leaving creases at the lower corners, price in pencil on flep, a bit of foxing present, light usage only, 3 R's Used Books and Hannelore Headley Old & Fine Books, Inc. are committed to saving the trees one leaf at the time!. Hard Cover. Good +/No Jacket. 1989-04-08. Good. Ships with Tracking Number! INTERNATIONAL WORLDWIDE Shipping available. May not contain Access Codes or Supplements. May be ex-library. Shipping & Handling by region. Buy with confidence, excellent customer service! Garden City, NY: Halcyon House, 1942 First published by Lippincott in 1940, this 1942 Halcyon House reprint also features the zebra stripped cloth covers. Slightly thinner, being printed on a lower grade of war-time paper. 376 pages, plus illustration pages. Cloth remains bright, but shows some wear at spine head, and a little very light wear at heel and other corners. Top hinge is cracked and a little loosened but holding. Otherwise clean and intact.. Reprint. Cloth - Hard Cover. Good/No Jacket. 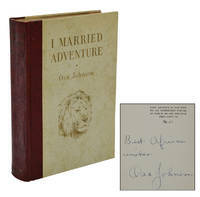 I Married Adventure: The Lives and Adventures of Martin and Osa Johnson. Philadelphia:: J. B. Lippincott Company,. Very Good. 1940. Hardcover. 85 aquatone photographs. No statement of printing. Age toning along the spine, previous owner's name and date (June 1940) on front paste-down, light foxing on endpapers, else very good in zebra pattern covered boards. No dust jacket. ; 376 pages . Philadelphia:: J. B. Lippincott Company,. Good. 1940. Hardcover. 85 aquatone photographs. A later printing. Age darkened along the spine, moderate shelf wear and aging, previous owner's name and date (1940) on front free endpaper, else good in zebra pattern covered boards. No dust jacket. ; 376 pages . J.B. Lippincott, 1940-01-01. Hardcover. Good. First edition with "Adventure" in italics missing the jacket and inked gift note. Please email for photos. New York: Halcyon House, 1942. Same format as first printing, with original zebra stripe design. Jacket is also identical to that of the first pinting; it has a 1/2" V chip on jacket spine corner and very light rubbing to the flap edges, and is otherwise whole, clean and bright. In a Brodart cover. A presentable, attractive copy in the original format.. First HH Edition. Hard Cover. Fine/Very Good. Illus. by Photographs. Large Octavo. 1997-08-04. Good. Ships with Tracking Number! INTERNATIONAL WORLDWIDE Shipping available. May not contain Access Codes or Supplements. May be ex-library. Shipping & Handling by region. Buy with confidence, excellent customer service! J.B. Lipincott, 1949. Hardcover. Very Good. Bookplate on half-title page. Light general wear to covers. Zebra stripe pattern on covers. 376 pages.